Green tea ice cream is a popular Japanese ice cream flavor and perfect as a sweet and refreshing dessert after a traditional Japanese meal. The name "green tea ice cream" is slightly deceptive, because the ice cream itself is not made from tea, but rather from matcha powder. Sometimes, the names "green tea ice cream" and "matcha ice cream" are used interchangeably in the West, but in Japan "green tea ice cream" is almost always referred to as "matcha ice cream." Matcha powder is a fine bright green powder of special green tea leaves which have been ground. Essentially, matcha is green tea leaves. Matcha powder differs from green tea because in foods that use matcha contain the actual tea leaves themselves, but green tea-infused foods are simply water infused with the flavor of the tea leaves. 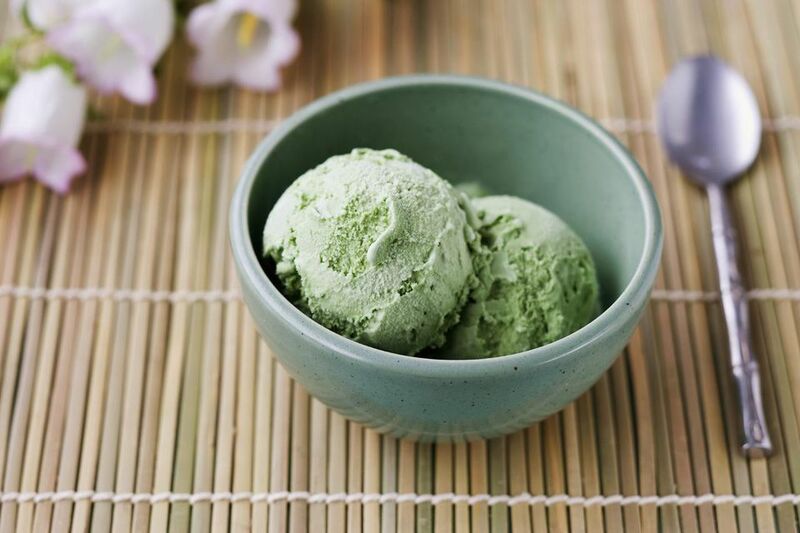 Rest assured, despite the technical differences between green tea and matcha powder, this recipe for green tea (matcha) ice cream will result in a delicious frozen Japanese dessert! Note: An ice cream maker does help, but if you are not using an ice cream maker, the mixture for the ice cream may be stored in an air-tight container and placed in a freezer until it solidifies. The mixture must be mixed periodically while it is freezing. Article Updated by Judy Ung. In a small bowl, mix hot water and matcha tea powder together and set aside. After separating the yolks from the eggs, in a medium size saucepan, lightly whisk the egg yolks. Note: Do not heat the pan yet. Add sugar in the pan, and mix the sugar with egg yolks until well incorporated. Gradually add milk to the egg and sugar mixture and mix well. Put the pan on low heat and heat the egg mixture, stirring constantly to make sure it doesn't burn. When the mixture thickens slightly, remove the pan from the heat and set aside. Soak the bottom of the pan in ice water to help cool the egg mixture. Add the matcha powder and water mixture into the egg mixture and mix well. Continue to cool the mixture in ice water. Whip the heavy cream so that it is slightly thick and airy. Add this whipped heavy cream into the egg and matcha mixture. Gently incorporate all the ingredients using a spatula, until mixed.